Gettin Lacquered Nail Art Every Month! There are all kinds of subscription boxes found on the web. These special boxes can be purchased as a gift or for yourself and every month you receive specific items depending on your box. I have reviewed different ones here on AME over the years. For example some offer products for moms and babies, others for men's products, beauty products, snacks and even pet products. Personally I think these types of boxes make wonderful surprise gifts for loved ones or if you want to treat yourself to something different. Besides, who doesn't like getting surprise gifts of something they enjoy delivered right to their door! Canadian owned, Gettin' Lacquered offers monthly gift boxes for nail enthusiasts! Often nail polish and nail art tools can be expensive for Canadians. I know this from having a bit of an addiction to new nail stuff, if you want quality you will pay for it. The team at Gettin' Lacquered choose the best of the best from brand name polishes like Essie, China Glaze and Seche to bring nail enthusiasts a monthly box to get their polish on for less than what one would pay at a drug store or online shop. In each box you will find five items including a mix of nail polishes plus nail art tools, decals or nail wraps to beautify your DIY mani! 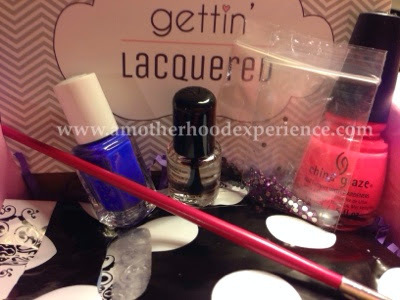 For $19.99 a month with no obligation to commit to any subscriptions, Gettin' Lacquered is every nail polish lovers dream gift. I was sent over some samples of what Gettin' Lacquered has to offer! I love the picks that were included in this box: Thistle Do by China Glaze, from their new neon collection. It's a nice bright colour, something to make a POP with this summer. 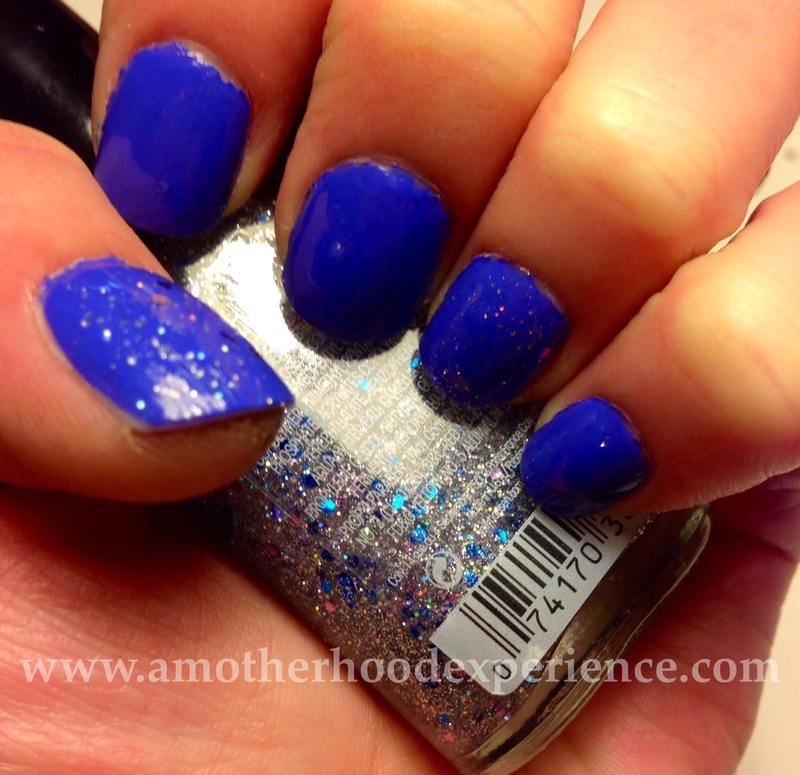 Chills & Thrills by Essie, a cool blue tone to change things up. Also included was a handy nail art brush, two little bags of rhinestone decals and Seche Vite quick dry top coat to get my lacquer on! I really like Chills & Thrills by Essie. A bright, popping blue colour! I added some China Glaze `Thisle Do` dots using a dotting tool I have. The blue and neon pink look great together, even with something simple like this. China Glaze `Thistle Do`is a a bright but soft colour, great for the upcoming sunny, summer weather! It almost reminds me of a neon princess pink, especially with the added purple rhinestones! I like boxes like Gettin` Lacquered as it allows me to add on to my ever growing polish collection. I love to mix and match different colours and styles! On top of offering the best products in their boxes, Gettin' Lacquered also offers great deals. For the month of May, Gettin' Lacquered let YOU pick a special colour and the rest a surprise! Can't wait to see what the May box brings! It's super easy to get started! Gettin Lacquered is based in Canada and only ships within Canada at the moment. Check out the website and get your polish on! Posted on behalf of Gettin Lacquered. Complimentary products received for review purposes. Comments and opinions on this blog are those of the author. The Healthy Shopper - Spring 2014 Picks! Join the #loveontfood Twitter Party June 3rd! Get Wired with Heather Boyd Wire Designs! Discover the Plusabilities with Tide! A Motherhood Experience Turns FIVE!